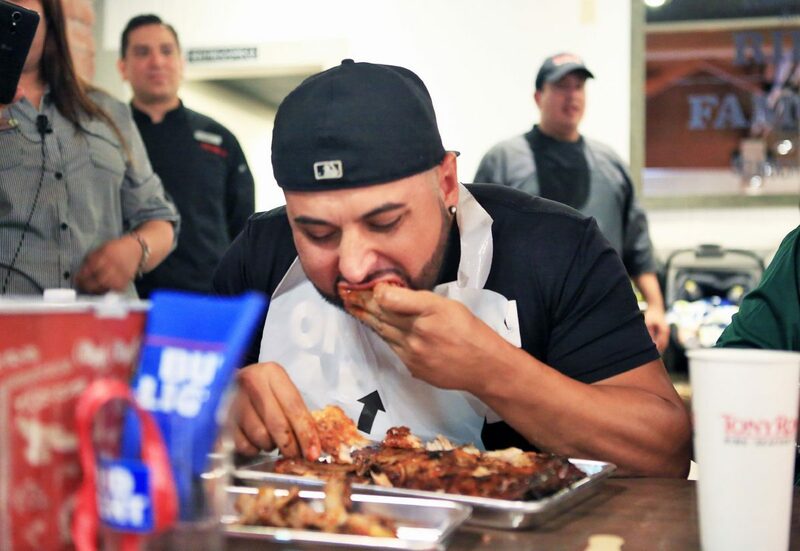 Guillermo Gonzalez work on two racks of ribs during the rib eating contest at Tony Roma's on Saturday, Aug. 25, 2018, in McAllen. McALLEN — 12 men and women sat at a long table at Tony Roma’s in McAllen with nothing but two slabs of ribs, a cup a water and an emergency bucket in front of them. In 3 minutes, one of them would become champion of the second annual Tony Roma’s rib-eating contest. Guillermo Gonzalez, a McAllen native and champion of last year’s contest, pushed the bucket to the side and took a few sips of water to loosen up. At last year’s contest, he ate twice as much as everybody else, so at this point, he’s feeling pretty confident. Last year he ate at 5 a.m. before the competition at 1 p.m., a change of step from his usual three heavy meals a day. On Saturday, he hadn’t eaten since lunch the day before. Others had been training diligently for the competition a well. Chris Jacobs, an anchor for CBS Channel 4, had been testing skills over the past weeks. Prior to the competition, he ate nothing but a pack of crackers and went on a run to boost his appetite. However, his efforts went in vain once the results from the competition didn’t even place him in the top three. Though, there’s no such thing as a loser in an eating competition, he said. In Jacobs’ defense, the competition was fierce — not even Gonzalez, last year’s champion, made it to the top three this year. Yustino Hong, a track and field coach at Sharyland High School, was this year’s winner, taking home a year’s supply of Tony Roma’s ribs and a barbecue pit as his prize. Hong had no idea he was participating until a few hours before the competition when his coworker backed out. Luckily, Hong said, eating isn’t the type of skill you can practice; if you’re like him, you were born to do it. When asked if he had dinner plans for that evening (perhaps tapping into his year’s supply of ribs) he was hesitant but didn’t dismiss the idea.